When President Theodore Roosevelt signed, in 1906, the legislation that made the Petrified Forest a national monument (it didn’t become a national park until 1962), it encompassed only the southern part of the current park. What’s now the northern tip of the park was in private hands, and those hands belonged to entrepreneur Herbert Lore. 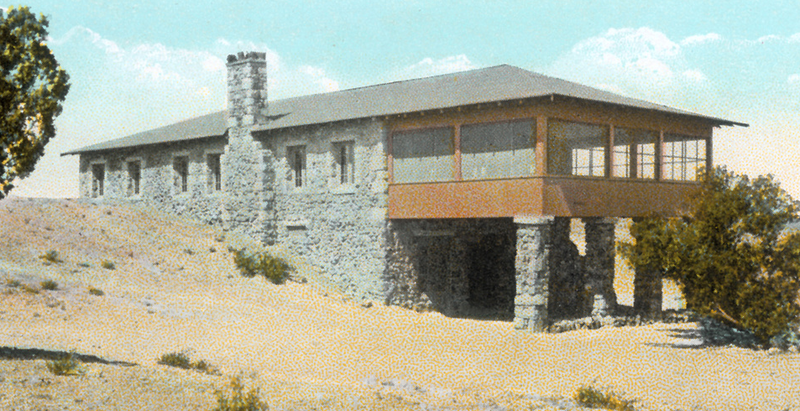 Around 1919, Mr. Lore built a two-story inn (local Native Americans provided the labor) made of petrified wood on the property, for tourists who were visiting the Petrified Forest. Mr. Lore ran his inn (photo above is from a postcard; photo credit to the NPS) until 1935, when the National Park Service bought it and his land for $59, 400. 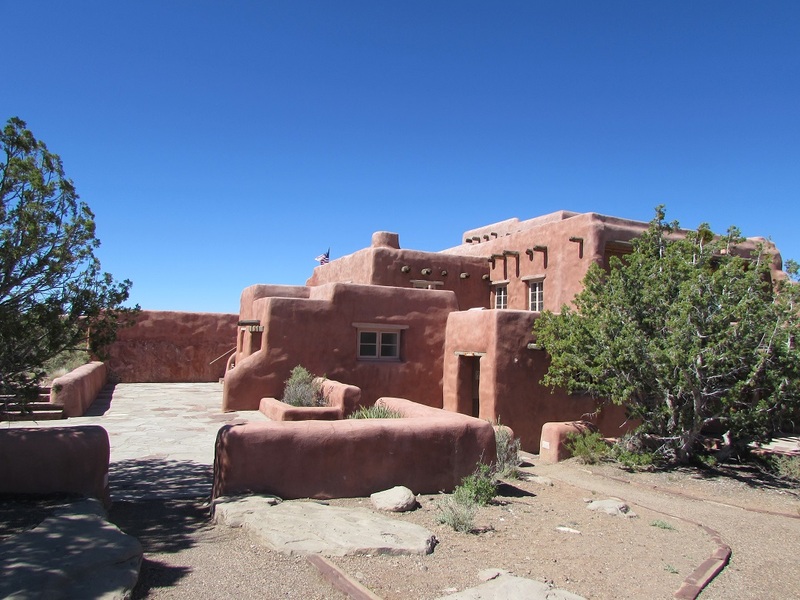 The NPS expanded the inn (this time, the Civilian Conservation Corps provided the labor) in the Pueblo Revival style, covering the original petrified wood exterior with adobe to match the new build. 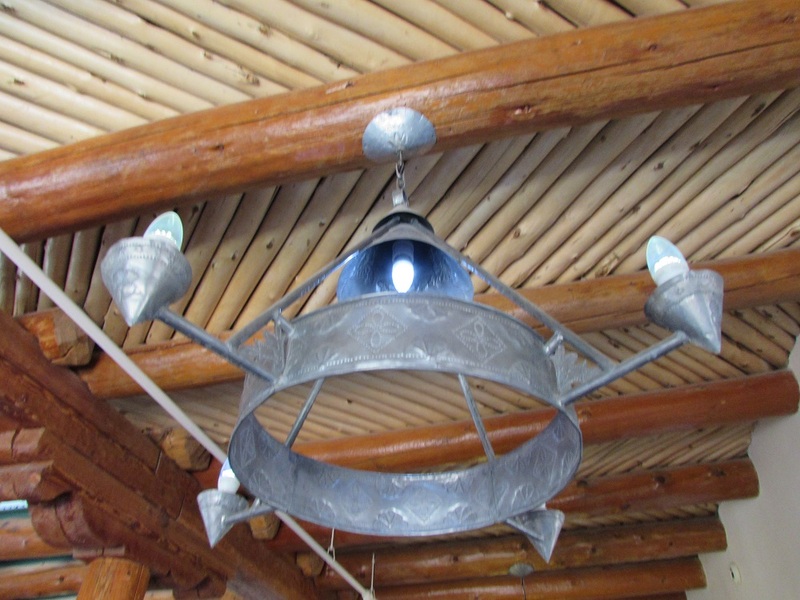 The CCC also built the furniture and crafted the tin Mexican style chandeliers. And put in the pine and aspen ceiling. From 1940 to 1963 (with a brief closure during World War II), the Fred Harvey company operated the inn for the NPS, as a Harvey House. The Harvey Houses were a chain of restaurants and hotels, usually situated next to a railroad stop, that crossed the mid and south west. The chain became famous for its waitresses, called Harvey Girls, who were required to conduct themselves according to strict deportment rules and bring a “civilizing” effect to the wild west. After World War II, renowned architect Mary Jane Colter made some design revisions, which included making the interior more southwestern. 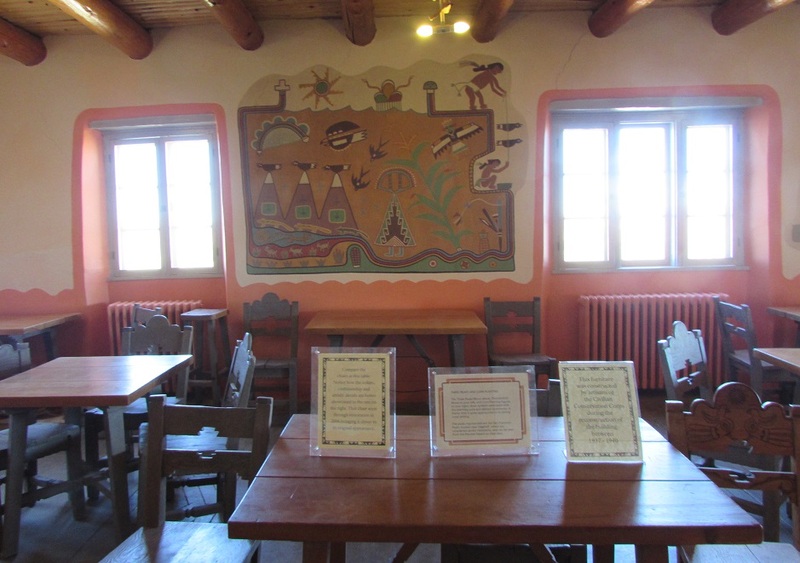 The mural below, along with several others at the inn, was painted by Fred Kabotie, a Hopi artist, in 1948. The inn no longer functions as a restaurant or hotel. It’s now strictly a museum, open for self-guided tours. There was an extremely enthusiastic and knowledgeable volunteer docent there, who knew the answer to every esoteric question I threw at her. This petroglyph, she said, was in the way when they decided to build a road through the park. So they moved the petroglyph. That’s not the official version that’s on the sign next to the petroglyph, though. That says that a ranger/paleontoloist found it and decided that it needed to be in the park museum. “The thing is,” said the docent, “these days, we would never move the petroglyph to accommodate the road. We have more respect for local culture. Nowadays, the road would be moved to accommodate the petroglyph.” It’s called the Mountain Lion petroglyth and it’s now the park mascot, appearing on t-shirts and refrigerator magnets and such. “You’ve found our stained glass skylight,” she said, as I zoomed straight to it as I entered the inn. 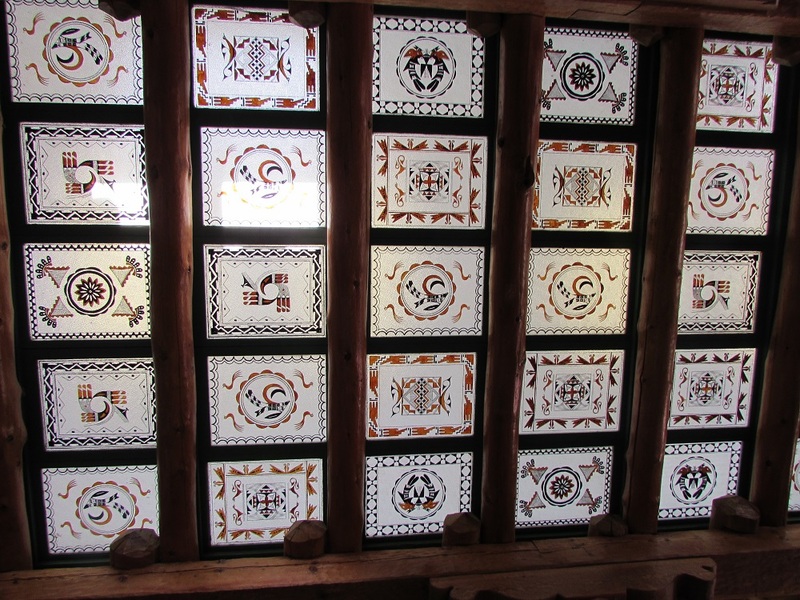 Each pane has a Native American pottery design. Stencils of the designs were created by a Native American artist, then CCC workers were taught to paint the glass panes using the stencils. The inn sits on the rim of a canyon and when Herbert Lore owned the inn, there was a road that went from the inn to the desert floor, to allow visitors to drive around the Painted Desert. You can still hike to and around the floor, but there’s no such road today. 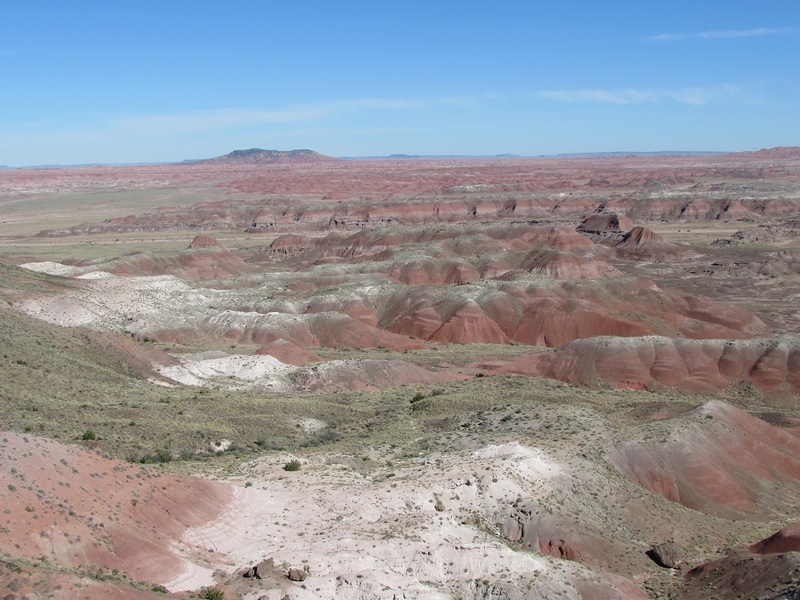 There is, however, a half-mile rim walk that starts at the inn, that allows visitors a good look at what the northern part of the Petrified Forest has to offer. I love the beautiful structures of the US national parks — lodges, bridges, walls and gazebos — many of which were built at the turn of the 20th century in my favorite design style, Arts and Crafts. 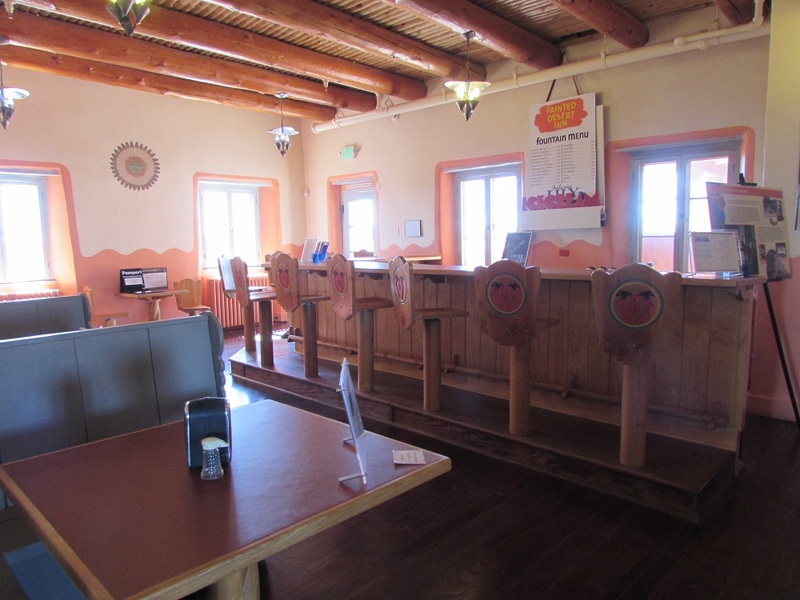 The Painted Desert Inn at the Petrified Forest isn’t arts and crafts, but it’s use of Native American artists and design made it a worthy stop on the national park trail. I have been to the Painted Desert but not to the inn. It looks like an interesting place. It’s worth a look, if you’re there again. This one is interesting because it’s an exception to the “park lodge” design of so many national park hotels. There was an old movie about the Harvey Girls featuring Judy Garland. Gorgeous shots – great views. 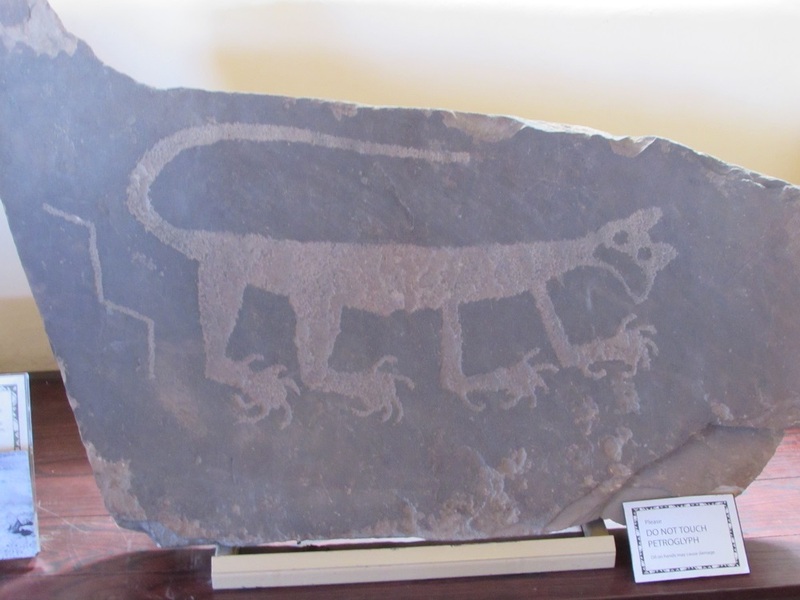 Especially love the petroglyph design – looks like a cat! I watched the Harvey Girls movie after we got back. Did not know that the song Atchison Topeka and the Santa Fe.came from that film.